Children love to pretend and making masks is a fun and easy way of letting them do this. Today we made a lion and a lamb mask for the month of March. 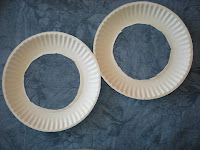 The paper plates will need to have the centers cut out. I did this. If you have older children, they may be able to do this part. I then attached the tongue depressor to the plate. I used tacky glue as it is a bit stronger. I then used a clothespin to keep it in place until the glue dried. Next we raided the scrap box for paper for ears. I used white and pink for the lamb and brown and yellow for the lion. 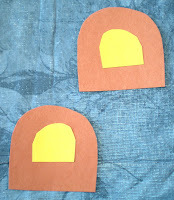 Let the children cut them into a shape they think looks like an ear. 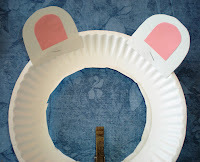 I attached my ears with a stapler just for time purposes, but you can allow the children to glue them on. 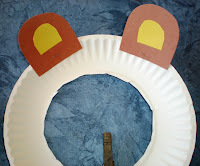 The final step was to cover the ring of the paper plate with glue. 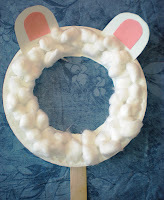 For our lamb we used lots and lots of cotton to make it fluffy and white. I had cut some orange and brown yarn for the lion's mane. The children piled on the glue and covered it with the yarn. This is my fav part of this day that you wrote "I then attached the tongue depressor to the plate. I used tacky glue as it is a bit stronger. 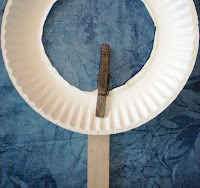 I then used a clothespin to keep it in place until the glue dried." 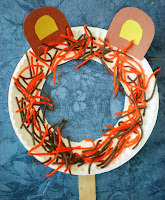 Love this craft, will use it this Sunday in our Kid's Church. Thank you so much for sharing! Great project for kids. 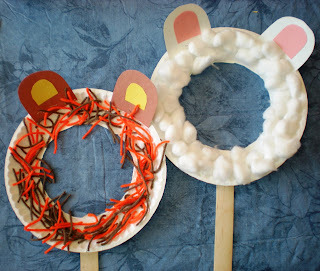 Easy and fun for them to do... And their little faces will look so cute peeking out from the masks!